Starring Kevin Hart, Tiffany Haddish, Al Madrigal, Mary Lynn Rajskub, Rob Riggle, Romany Malco, Fat Joe, Taran Killam, Ben Schwartz, Anne Winters, Megalyn Echikunwoke, Keith David, Loretta Devine, Jacob Batalon, Yvonne Orji, Bresha Webb, Tilda Del Toro, Mason Guccione, Maria Legarda and Brooke Butler. Screenplay by Kevin Hart, Harry Ratchford, Joey Wells, Matthew Kellard, Nicholas Stoller, John Hamburg. Distributed by Universal Pictures. 111 minutes. Rated PG-13. You know what you are getting when you go to a movie like Night School. It is not going to be an Oscar-caliber film. It may not even necessarily be a good film. It may get kind of silly. It may have parts that leave you shaking your head, wondering what the heck they were thinking. But, the real question going in is simply this: Is it funny? Will it make you laugh? The answer in the case of Night School is: Yes, pretty much. It’s far from a perfect film – but it isn’t trying to be. All it is trying to do is get people laughing, and it succeeds fairly consistently at that goal. Luckily those jokes are told by some very accomplished comedians. Honestly, probably a little too gifted for the material they are given here. Kevin Hart is reliably funnier than his material, and Tiffany Haddish – the breakout star of Girls Trip – shows that performance was not a fluke. And they are surrounded by a very good ensemble of comic actors – Mary Lynn Rajskub, Rob Riggle, Romany Malco, Taran Killam and Ben Schwartz. The storyline – if you could call it that – has a fast-talking hustler named Teddy (Hart), with a gorgeous fiancée and living way above his means, losing his job. In order to get another job, the high school drop-out must go back to get his GED, taking a class at the same school he walked out of decades earlier. And – awkward plot twist – his biggest rival from the old days (Killam) is now the principal. Add to that fact that he meets his no-nonsense new teacher (Haddish) in a traffic argument, and the fact that Teddy can’t be bothered to actually study, and things are looking a little grim for the guy. Much of the time is spent in the night school courses, and Hart and Haddish are surrounded by a group of fellow students. Al Madrigal, Rajskub, Riggle, Malco and old-school rapper Fat Joe are all effortlessly likable and funny, even if their characters would have to be pumped up a bit to even become one-dimensional stereotypes. And if occasionally the jokes go way too far – a MMA tutoring session and a guy falling from the high school roof come immediately to mind – more of the jokes hit than miss. Really, that’s all that matters to the filmmakers. 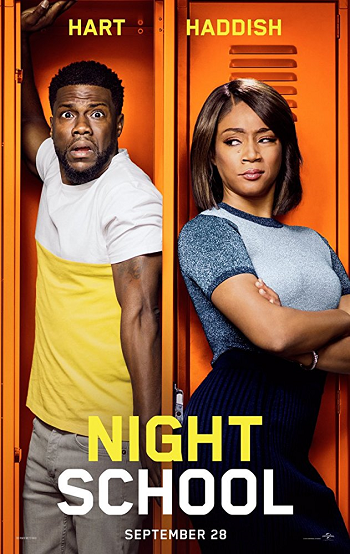 Night School will never be called a classic but taken at its own modest level it mostly works. Tags: Al Madrigal, Anne Winters, Ben Schwartz, Bresha Webb, Brooke Butler, Fat Joe, Harry Ratchford, Jacob Batalon, Jay S. Jacobs, Joey Wells, John Hamburg, keith david, Kevin Hart, Loretta Devine, Malcolm D. Lee, Maria Legarda, Mary Lynn Rajskub, Mason Guccione, Matthew Kellard, Megalyn Echikunwoke, movie review, Nicholas Stoller, Night School, PopEntertainment.com, Rob Riggle, Romany Malco, Taran Killam, Tiffany Haddish, Tilda Del Toro, Yvonne Orji. Bookmark the permalink.